In Hollywood, a story is the product you’re selling. People pay money for the story. Whether it’s a film, a TV show, or theater, the story is the basis of the transaction, and that story most likely is linear. It has a beginning, middle and end. It has a fixed duration. Half hour. Hour. 90 minutes. 107 minutes. Three Acts. Two Acts and an Intermission. Seven Acts With Commercials Between. Eleven Minutes of a VR Immersion. Where 99% of you are concerned, you are not selling stories. You can’t mimic the Pixar or Disney storytelling process and expect similar outcomes when their product is stories and yours is not. It’s like water skiing behind a swimming horse. Your objective and the horse’s process are mis-matched. So then if the story isn’t a product, what is it? What work do stories do? What is the return on your investment? To most organizations and communities, stories are a means of generating and describing value to a customer or citizen audience. Don’t get us wrong, linear stories still have their uses. They are valuable outputs, and we love them in all their forms. The inputs, however, are multi-linear. They come from infinite sources, and they come in non-fixed durations. They consist of many beginnings, middles and ends [to storylines]. They are heavy on data that lacks sufficient context to be understood and acted on. 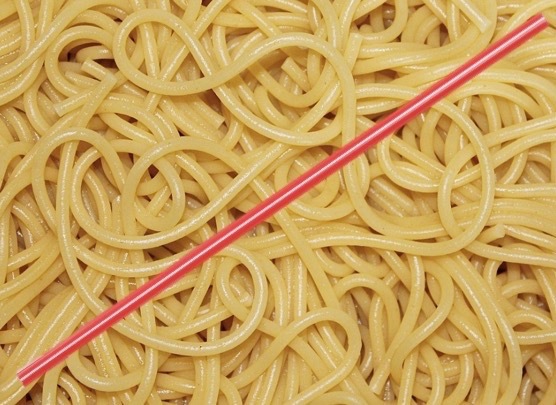 To have a linear storytelling mindset in a networked environment, with all the complexity it entails, is like trying to eat a plate of spaghetti with a straw. Can it be done? Probably, but your food will be cold and everyone will have moved on by the time you’re finished. And the meatballs? Fuggedaboudit. To turn all these inputs into productive realities, your storytelling process must be designed to address and resolve the complexities of the inputs. Big Data needs Big Story to be fully appreciated, like grapes need wine. Organizations and communities begin every day, every quarter, every fiscal year, at multiple stages of multiple storylines. Those storylines will be tested and affected, and their tempo changed, by inputs of data and other communication throughout the the time frame. If you begin a day fixated on one particular story outcome, you will miss most of the other productive outcomes made possible along the way, as new inputs arrive, affect your story, and change the odds. If you want the stories your organization produces to be unique, the best way to do that is to make your storytelling process unique. Remember, you’re not in the storytelling business, you’re in the business of generating economic outcomes that make good stories. Those story outcomes take six forms: Opportunities, Solutions, Identities, Innovations, Communities and Conversions. Differentiate your process to differentiate these business outcomes and the brand you represent to the world. If you do, the odds will get better as you go, and the world will want to play along. All employees are disobedient. All customers talk to one another without your input. All citizens complain. If you expect the world to follow your script, these things are negatives, because the world doesn’t follow a script. If, instead, you see that an organizational or community story is never complete, an employee’s dissatisfaction with the status quo can become a source of innovation or process improvement, and a citizen complaint a basis for civic engagement. If you see yourself not as authoring stories so much as participating in them, your audiences’ stories give you lots of opportunities to customize your offering, and develop the relationships with influencers and others that fuel your brand going forward. In a socially-mediated economy, participation is a powerful form of persuasion.